NJTV LIVE: (earlier newscast of events this morning). A 1:00 PM NEWS CONFERENCE IS ANTICIPATED. David Wildstein has pled guilty on two charges in Bridgegate. Indictments are anticipated later today. 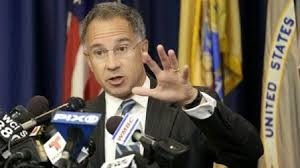 Fort Lee Mayor said to have been subject of political retaliation. One senior legal beagle on the federal court scene says the early announcement of a plea deal with a key player (Wildstein) cooperating and related BridgeGate indictments makes the issues raised by local mayors Steve Fulop of Jersey City and Mayor Dawn Zimmer of Hoboken "credible." "Prior to on or about August 12, 2013, did you have separate discussions with Mr. Baroni and Ms. Kelly about how the Local Access Lanes could be used as leverage against Mayor Sokolich," Wigenton asked Wildstein during a series of 43 questions outlining his role in the scandal. "Did you agree with others, including Mr. Baroni and Ms. Kelly, to punish Mayor Sokolich for not endorsing Governor Christie by deliberately causing significant traffic problems in Fort Lee," he asked. US Attorney Paul Fishman will be holding the news conference at 1:00 PM. “The closing of the Fort Lee access lanes to the George Washington Bridge in an apparent act of political retaliation was an egregious abuse of power, and I am gratified that some of the individuals involved are being held accountable. The U.S. Attorney has so far taken no action regarding the conversation the Lieutenant Governor had with me in which she linked Superstorm Sandy aid with redevelopment decisions in Hoboken that were important to a client of David Samson. I stand behind my account which was corroborated by substantial additional evidence. In addition to my contemporaneous journal entry, I told six people about the conversation on the day it occurred, including a lawyer representing the City of Hoboken. In our conversation, the Lieutenant Governor implied to me that she was speaking for the Governor who she said she was with that Friday night. I learned for the first time, months later, upon reading the report of the Governor’s own Counsel Randy Mastro, that the Lieutenant Governor and Governor were indeed together that Friday night at a retreat, as she had told me. My responsibility is to cooperate with all legitimate investigations, tell the truth both to the public and to the U.S. Attorney, and to protect the best interests of the people of Hoboken. That is what I have done and what I will continue to do. It is the U.S. Attorney's responsibility to determine whether these facts, as well as whatever other information they obtained as a result of their investigation, constitute a criminal offense provable beyond a reasonable doubt. As you may know, this Sunday is the Hoboken Arts and Music Festival. This year I will be setting up a table, and would like to invite you to stop by during the festivities! During the fair, we will be registering new voters (or you can register to change your address if you have moved within Hoboken), distributing information about various new and exciting city initiatives, and holding "office hours", of sorts, for residents to discuss any issues with me and several of my council colleagues who will join us at the table during the day. If you or your friends/neighbors recently moved to Hoboken or just have never registered to vote, Sunday is the easiest way to ensure you can vote in future elections and make your voice heard. You may also have questions about city issues or service requests. We will be there on Sunday to get you answers and provide you with assistance. What are the plans for Washington Street and when will it be repaved? How about Observer Highway? Will my property taxes go up or down this year and why? What is the Rebuild By Design Resist, Store, Delay and Discharge project, and why is it so important to Hoboken's future? When are we finally building a park in the Southwest and what will it look like? Are there any other major park initiatives in the works? What is the new composting program - is it mandatory and how do I sign up? How are we handling development as new neighborhoods develop and thrive? What is being done to reduce flooding, both short and long term? Come by our table this Sunday to discuss these issues and more. Your input is valuable and I want to hear from you! The weather should be great on Sunday, so we hope to see you there! I will post the location of our table on my Facebook page, http://www.facebook.com/ravibhallahoboken or on Twitter @RaviBhalla once we receive that information.